The Delaware River Basin Commission (DRBC) has extended the period for written comment on proposed regulations regarding hydraulic fracturing activities in the Basin from Feb. 28 to March 30, 2018. Two additional public hearings also have been scheduled in February and March. The commissioners extended the period in response to requests for more public input opportunities and opportunities for government officials to study the proposed regulations. Those interested in commenting are encouraged to review the full text of the draft rules, related materials, and information on the public input procedures on the commission’s website at www.drbc.net. Feb. 22, 2018, 3 p.m. to as late as 7 p.m. at the Lisa Scheller-Wayne Woodman Community Services Center, Lehigh Carbon Community College, 4525 Education Park Dr., Schnecksville, Pa. Register in advance to attend at http://bit.ly/2qI1tBC or register onsite. Persons who have registered to attend by 5 p.m. January 26, 2018, will be contacted by the DRBC prior to the hearing date and provided with an early opportunity to request speaking time. Registrants may also sign up to speak at the hearing and will be heard if time allows. Elected government officials and their staff will have the opportunity to identify themselves when registering. March 6, 2018, 1:30 p.m. to 3:30 p.m. The Commission will host a moderated public hearing by telephone. Members of the public are encouraged to listen by calling 1-866-831-8713 and asking the operator to connect them to the DRBC call. Those wishing to address the Commission at this hearing can register for an opportunity to speak at http://bit.ly/2pdqxQ9. Seating is still available at all four of the public hearings scheduled in January. Those who would like to attend are encouraged to register online through 5 p.m. on the day preceding each hearing. Onsite registration for each hearing will also be available. Those who have not registered in advance should check capacity through the online system before traveling to attend a hearing. In December 2010, the DRBC drafted and published environmental protection regulations for the watershed that were open for public comment until April 15, 2011. After reviewing these comments, the DRBC then published a revised version on November 8, 2011; however, the special meeting to consider adoption of the revised regulations was postponed until now. The 2011 revised draft rules applied to all “natural gas development projects” regardless of whether or not hydraulic fracturing was planned, and contemplated authorizing water use for not more than 300 natural gas wells under certain circumstances and conditions. Prohibitions relating to the production of natural gas using horizontal drilling and hydraulic fracturing within the Basin, and specifically prohibiting the use of “high volume hydraulic fracturing” within the Basin. Provisions intended to ensure the safe and protective storage, treatment, disposal, and/or discharge within the Basin of wastewater associated with horizontal drilling and hydraulic fracturing for the production of natural gas, where permitted. Regulation of the inter-basin transfer of water and wastewater for purposes of natural gas development, where permitted. A full text of the draft rules, related materials, and information on the public input procedures can be viewed on the Commission’s website here. The DRBC has not set a timeline for voting on final regulations. Until the Commission approves the regulations, the Pennsylvania Department of Environmental Protection (PADEP) will not issue drilling permits. Written comments on the draft regulations, which will receive the same consideration as oral comments, will be accepted until 5 p.m. on March 30. Written comments will not be accepted through other methods, such as email, fax, or hand delivery unless an express exception has been granted based on lack of access to the web-based system. Requests for exceptions may be addressed to: Commission Secretary, DRBC, PO Box 7360, West Trenton, NJ 08628. The DRBC is a regional body with the goal to oversee management of the Delaware River system across state boundaries. It was created in 1961 as an interstate compact in response to a 1954 Supreme Court decision to settle water use disputes among Pennsylvania, Delaware, New York and New Jersey. The DRBC consists of governors from the four states and the Division Engineer of the North Atlantic Division, U.S. Army Corps of Engineers. The DRBC employs a staff of engineers, biologists, geologists, and other specialists. To learn more about the commission, please visit www.drbc.net or follow DRBC on Twitter at @DRBC1961. The Delaware River Basin Commission (DRBC) announced this month draft amendments to its plan and regulations to better provide for the planning, conservation, utilization, development, management and control of the basin’s water resources in connection with the hydraulic fracturing of shale and other hydrocarbon-bearing formations. In December 2010, the DRBC drafted and published environmental protection regulations for the watershed that were open for public comment until April 15, 2011. After reviewing these comments, the DRBC then published a revised version on November 8, 2011; however, the special meeting to consider adoption of the revised regulations was postponed until now. The revised draft rules prohibit high volume hydraulic fracturing in hydrocarbon-bearing rock formations within the Delaware River Basin. In addition, the rules reinforce the commission’s current policies that discourage the importation of wastewater and exportation of water, and include rules to address the inter-basin transfer of water and wastewater related to hydraulic fracturing. The rules include provisions confirming that the treatment and disposal of produced water from hydraulic fracturing does not impair or conflict with the preservation of the waters of the basin for uses in accordance with the DRBC comprehensive plan. Jan. 23, 2018, 1 p.m. to 4:30 p.m. at the Ladore Camp, Retreat and Conference Center’s Performing Arts and Recreation Center (PARC) Pavilion, 287 Owego Turnpike, Waymart, Pa. Register to attend at: http://bit.ly/2ApxOB1. Jan. 23, 2018, 6 p.m. to 9:30 p.m. at the Ladore Camp, Retreat and Conference Center’s Performing Arts and Recreation Center (PARC) Pavilion, 287 Owego Turnpike, Waymart, Pa. Register to attend at: http://bit.ly/2AgHtsV. Jan. 25, 2018, 1 p.m. to 4:30 p.m. at the DoubleTree by Hilton Hotel Philadelphia Airport, 4509 Island Ave., Philadelphia, Pa. Register to attend at: http://bit.ly/2AIPh7P. Jan. 25, 2018, 6 p.m. to 9:30 p.m. at the DoubleTree by Hilton Hotel Philadelphia Airport, 4509 Island Ave., Philadelphia, Pa. Register to attend at: http://bit.ly/2ip6Pyn. Advance registration, which is required to attend, will remain open until 5 p.m., Dec. 31, 2017. Those who have registered to attend will be afforded an opportunity to request speaking time. The public also has an opportunity to submit written comments on the draft regulations. Written comments may be submitted until 5 p.m., Feb. 28, 2018. Written comments and attachments should be submitted through the commission’s online comments webpage at http://dockets.drbc.commentinput.com/. Written comments will not be accepted through other methods, such as email, fax or hand delivery, unless an express exception has been granted based on lack of access to the web-based system. Requests for exceptions may be addressed to: Commission Secretary, DRBC, P.O. Box 7360, West Trenton, NJ 08628. The PennEast Pipeline is a proposed 120.2 mile natural gas pipeline, designed to deliver natural gas across two states. The pipeline will begin at two existing interconnects of pipeline and deliver natural gas from Luzerne County, Pennsylvania to Mercer County, New Jersey. The Philadelphia District of the US Army Corps of Engineers released public notice in September soliciting public comments regarding the locations where the pipeline will cross bodies of water or wetlands. Find out about those locations from the Army Corps of Engineers. According to a release, the PennEast project is under the jurisdiction of the Federal Energy Regulatory Commission (FERC) which issued a Final Environmental Impact Study (FEIS) on April 10, 2017 for the PennEast project. The U.S. Army Corps of Engineers is a cooperating agency on that document. Public comments are due by Oct. 14, 2017 and can be sent to Penneast-Comments@usace.army.mil. The PennEast Pipeline Company announced the opening of the PennEast Powering STEM Grant Program Cycle, which supplies grants of up to $10,000 to nonprofit organizations in Pennsylvania and New Jersey. *Supporting general awareness about energy and environmental-related issues. The PennEast Powering STEM Grant Program was established in 2014, awarding over $700,000 to organizations making a difference in the community. Applications are due Oct. 6, 2017 and winners will be announced Oct. 24, 2017. For more information and to apply online, visit Penneastpipeline.com/Powering-Stem. The Delaware River Basin Commission (DRBC) announced in September that it will release a revised set of draft regulations for public comment, addressing natural gas development activities within the Delaware River Basin. Last year, a group of Pennsylvania Senators filed suit to life the moratorium on drilling in the Delaware River Basin, questioning whether the DRBC has the authority to prevent hydraulic fracturing in the basin. In January, a judge denied their right to participate in the suit. While no new regulations were finalized at a Sept. 13 meeting, the decision to publish the draft by Nov. 30 pushed the rulemaking into a new phase. The DRBC has not set a timeline for voting on final regulations. Until the DRBC approves the regulations, the Pennsylvania Department of Environmental Protection (PADEP) will not issue permits for drilling. According to a DRBC news release, the draft will include prohibitions on horizontal drilling and hydraulic fracturing within the river basin as well as guidelines to ensure safe storage, treatment, disposal and discharge of related waste. A full public comment period, including opportunities for written comment, will open after the revised draft is released. Details about that period will be available on Nov. 30. The DRBC is a regional body with the goal to oversee management of the Delaware River system across state boundaries. It was created in 1961 as an interstate compact in response to a 1954 Supreme Court decision to settle water use disputes among Pennsylvania, Delaware, New York and New Jersey. The DRBC consists of the governors from the four states and the Division Engineer of the North Atlantic Division, U.S. Army Corps of Engineers. The DRBC employs a staff of engineers, biologists, geologists, and other specialists. Updated information can be found at the DRBC website. Click here to download a PDF version of this document. The Appendices (572 pages, 10 MB download). RKR Hess has been following the progress of the report (here and here) and is pleased to provide a high-level review of the findings, highlights of data and conclusions specifically relevant to Marcellus Shale hydraulic fracturing in Pennsylvania, and links to additional information. We have maintained figure and text box references to the images pulled from the above reports so that they can be easily found in the context of the original report. A group of Pennsylvania senators is joining in an ongoing lawsuit that questions the authority of the Delaware River Basin Commission (DRBC) to place a moratorium on hydraulic fracturing in the river basin. Senators Lisa Baker, Joseph Scarnati and Gene Yaw have filed to join a lawsuit brought by a landowners’ group called the Wayne Land and Mineral Group, LLC (WLMG), according to The River Reporter. The original lawsuit by the landowners sought to reverse a decision by the DRBC not to issue a permit for an exploratory well. The senators’ motion to intervene questions whether the DRBC has the authority to prevent hydraulic fracturing in the basin. In a motion to join the suit, the senators claim the DRBC has worked around existing Pennsylvania state laws (specifically Act 13), according to the Pocono Record. In 2010, the DRBC voted to postpone well drilling in the basin until the commission could adopt further regulations. Proposed regulations were released in 2010, and revisions were published in 2011; however, the DRBC has not voted on final regulations and has not set a timeline for doing so. Until the DRBC approves the regulations, the Pennsylvania Department of Environmental Protection (PADEP) will not issue permits for drilling. Earlier this year, the commission announced that it would hold public hearings in response to public safety concerns surrounding construction of a pipeline that would potentially carry natural gas from the Marcellus Shale formation to interconnects near Bethlehem, Pennsylvania, and Mercer County, New Jersey. The Delaware Riverkeeper Network (DRN) also filed to join the landowners’ lawsuit, citing a need to ensure that health and safety issues surrounding hydraulic fracturing would be addressed. The DRN is a nonprofit organization created to protect rights to “pure water, clean air and a healthy environment,” according to its website. The suit is entering the discovery stage, according to the Pocono Record, but a timeline for the process has not been published. Public comments are now open on the PennEast Pipeline Draft Environmental Impact Statement (DEIS), released in July and prepared by the Federal Energy Regulatory Commission (FERC) in cooperation with several other agencies. The over 1,000-page DEIS examines the possible effects of the 119-mile pipeline, proposed to carry one billion cubic feet per day of natural gas between Pennsylvania and New Jersey. “Approval of this project would result in some adverse environmental impacts; however, most of these impacts would be reduced to less-than-significant levels with the implementation of PennEast’s proposed mitigation and additional recommendations in the draft EIS,” the draft states. The DEIS indicates that the environmental and visual impact of the pipeline would be “effectively minimized or mitigated” based on the project’s current plans. These impacts include disruption to five threatened or endangered animal and plant species located along the 119-mile stretch. Opponents of the pipeline argue that mitigation throughout the project will not be enough to limit the pipeline’s potential damage to the environment. Pennsylvania and New Jersey have yet to issue Clean Water Act certifications, and the project has not yet been approved by the Delaware River Basin Commission. However, the DEIS cited a November 2017 projected start date for the project, pending all necessary state and agency approvals. Released on July 22, the draft’s public comments phase will close 45 days later on Sept. 5. That period includes six public comment meetings throughout Pennsylvania and New Jersey. For brief, text-only comments, use the eComment feature under the Documents and Filings link at the FERC website. 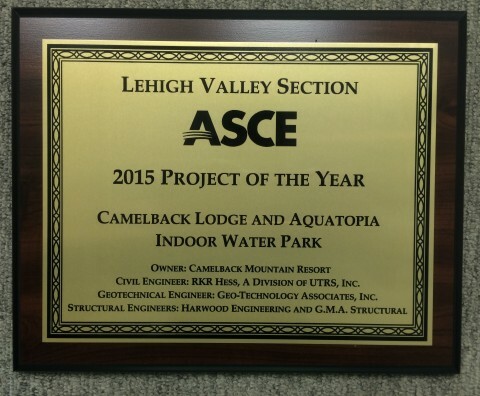 The Lehigh Valley section of the American Society of Civil Engineering honored the civil engineering team at RKR Hess, a division of UTRS, Inc., for its work on the Aquatopia indoor waterpark at Camelback Resort in Monroe County, Pennsylvania. 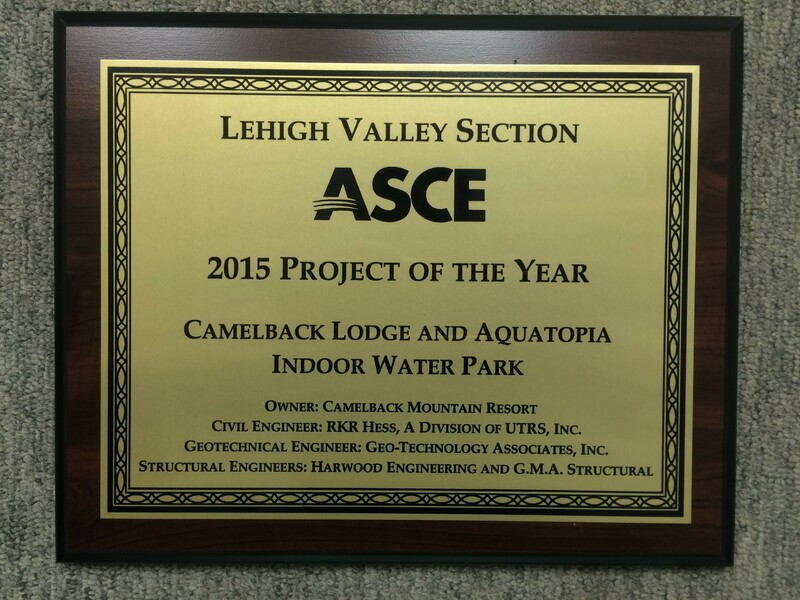 The Aquatopia feature of the resort is the largest ever built in a single phase and the largest ski-in/ski-out waterpark hotel in the country, according to Lehigh Valley Business. Nate Oiler, Engineer and Land Development Section Manager, accepted the Oustanding Civil Engineering Achievement award on behalf of RKR Hess, which shared the award with Geo-Technology Associates, Inc., and G.m.a Structural, LLC. The construction of Aquatopia included large infrastructure improvements, such as a new pump station to address new sanitation needs with the expanded water systems. Despite the size and scope of the project, several aspects were completed ahead of schedule, and the resort remained open at full capacity thanks to collaboration between all involved. RKR Hess, the civil and environmental engineering division of Universal Technical Resource Services, Inc. (UTRS), is located in East Stroudsburg, Pa. RKR Hess has an 80-year history of providing the highest quality engineering consulting services to both public and private sectors, maintaining a tradition of excellence and integrity. Our cadre of professionals, which includes Professional Engineers, surveyors, land planners and environmental scientists, provides a broad range of engineering and planning services to meet all our clients’ needs.